Slice into a juicy steak and savor the flavorful sides meant to compliment the perfectly cooked meat. There is definitely no need to struggle through the traffic to New York City with the steakhouses available right at your doorstep across the state of New Jersey. As the menu at ETC Steakhouse incorporates seasonal ingredients into their dishes, the menu changes frequently ensuring a fresh dining experience even to frequent visitors. An example of what diners may find on the menu are a range of creative appetizers, such as beef bacon with avocado, gnocchi, and buffalo cauliflower with carrot bread, hearty entrees, and a handful of sides. 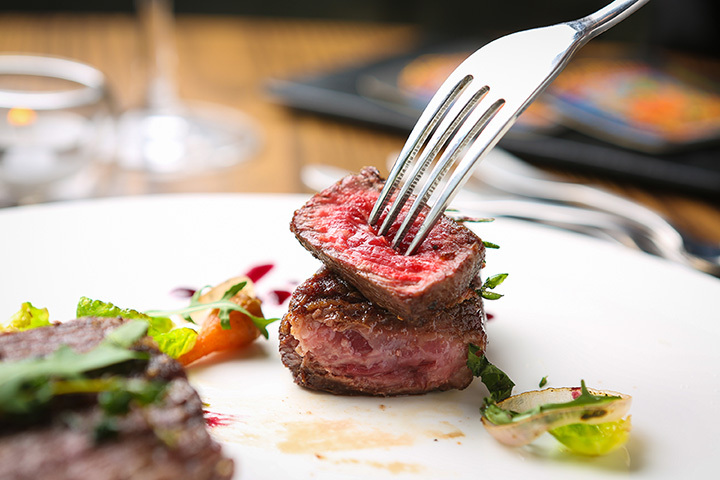 The steaks on the menu are perhaps their most raved about dishes, and diners can find options such as a peppercorn filet, rib eye, skirt steak, and hanger steak, all with unique pairings. ETC Steakhouse is also Kosher. Segovia Steakhouse and Seafood has been serving delicious steaks and Spanish inspired foods for more than 30 years. This elegant restaurant features Angus beef cut into ribeye, New York strip, and filet mignon cuts. The dinner menu at Segovia Steakhouse also features delicious tapas to start off your meal, with Spanish specialties such as pulp feria, pinchos, chorizo, and almejas oreganata. Celebrate the Steakhouse 85’s tenth anniversary with a visit to this traditional American steakhouse favored for their juicy steaks and excellent seafood. To cook their steaks to perfection each time, the steaks are seared on a cast iron grill and then broiled to your desired level. On weekdays only, Steakhouse 85 offers diners an excellent $99 prix fixe dinner menu for two, which includes wine and a three-course dinner of two starters, two entrees, a side, and two desserts. Enjoy fine dining at the Sweet Waters Steak House for their homemade French onion soup, delicious steak with a glass of wine, followed by one of their rich desserts. Their menu features perfectly cooked steaks including a nine-ounce filet mignon, 14-ounce New York strip, and a massive 20-ounce boneless rib eye. Each steak comes with one side, with options such as grilled asparagus, baked macaroni and cheese, and hot cherry peppers are among the most delicious. Sweet Waters Steak House is open for brunch, lunch, and dinner. This elegant fine dining restaurant offers all diners a flavorful experience with their Cuban-inspired flavors. On the menu at 345 Steakhouse, you’ll find numerous entrees with meat featuring heavily in most dishes. Their 100 percent certified Angus beef options include a porterhouse steak for one or two, New York strip, filet mignon, and sliced steak. Cuban flavors can be found in the Cuban-style stuffed steak, skirt steak, and palomilla steak as well as other options. Located in the Golden Nugget Hotel, Vi & Anthony’s Steakhouse is a favorite local restaurant with a wide selection of appetizers, salads, steaks, seafood, and more. Their steaks are sourced from the Midwest and are from USDA grain fed cattle. Their popular filet mignon is offered in three different sizes to please all appetites and steaks should be enjoyed with one of their flavorful sauces such as the blue cheese bacon butter or port peppercorn. Numerous sides are also available. Located just a short drive across the Lincoln Tunnel away from Manhattan, King Steakhouse is a great spot to dine outside of the always crowded Times Square. Their menu features numerous appetizers, a raw bar, pasta, seafood, poultry, and of course, steak. Steak cuts include a filet mignon, skirt steak, rib eye, and sirloin all served with specialty sides and a sauce. Ruth’s Chris Steak House is a well-known and well-loved international steakhouse chain that provides the same high-standard of steaks across all of their outlets. No matter the location, diners can expect perfectly cooked and seasoned steaks in a variety of cuts. To accompany the star of the show—the steak—there are several sides, including lobster tail, shrimp, grilled asparagus, lobster mac & cheese, roasted Brussels sprouts, and potatoes au gratin. This popular steakhouse chain offers diners juicy steaks at both lunch and dinner. On the menu, you’ll find their succulent filet mignon, dry-aged New York strip, and bone-in ribeye all cooked to your liking. Perfect accompaniments, such as parmesan truffle fries, au gratin potatoes, and Brussels sprouts with bacon, are meant for sharing among your party. Steaks at the River Palm Terrace are dry aged for 28 days to ensure the prime taste of their hand selected Angus beef. In addition to their crowd-pleasing cuts of steak, the River Palm Terrace also has seafood and sushi on the menu, and a large wine list.